The processed, pre-packaged food in the small, Ecuadorian indigenous village of San Clemente puzzled me. Why would a village so culturally rooted in their sovereign food system consume processed foods shipped from across the world? The agricultural system, independent from these foods, appears to function with grace: chakras, the plots of land used to grow produce for the family, lie next to every house and thrive through sustainable gardening methods. Traditional Andean crops such as potatoes, mellocos (Ullucus), and quinoa play a fundamental role in the cultural identity of the village, shaping their festivals, rituals, and entire cosmology. Through this connection with “Madre Tierra” or “Mother Earth”, the village decides how, what, and where food production takes place—the basis for food sovereignty. But doesn’t the insidious colonization of the local food system by junk food undermine the community’s healthy and ecological food system? Of the six families I spoke to about food, all condemned packaged, processed, and pesticide-laden foods, yet admitted to buying these products at one of the three local stores on a weekly basis. The older generations expressed the greatest concern over the influx of processed foods, with one woman claiming that the processed foods being placed in the communal compost were to blame for lower production in recent years. 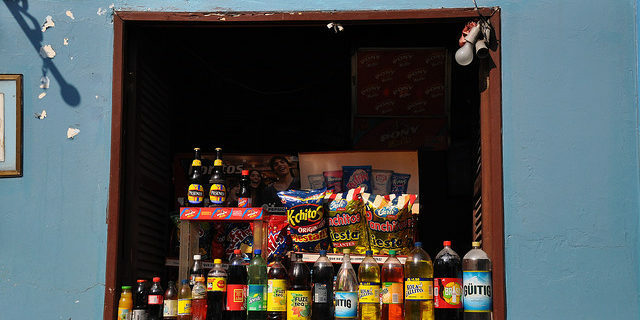 Only the elders remember a time without stores, all of which now resell products purchased at the Supermaxi grocery stores in the nearby city of Ibarra. The stores in town initially only sold salt, then added sugar, and today includes items such as Coca-Cola, Ritz Crackers, Nestlé candy bars, lollipops, and popsicles. A store owner expressed her support for sustainable agriculture over industrial methods in order to protect the bee population. However, a peek into her storefront gave me the opposite message… Given the industrial production of the food for sale, I had to ask, “Why sell processed food when you’re against its industrial production?” She responded with a shrug, “Kids love sweets and I have to compete with other stores”. I reflected a long time on the contradiction between the storeowner’s support for sustainable agriculture and doing the opposite within her store. Because of the dependence on monetary income, the store owners are all forced to compete with each other. Therefore, they have to sell this cheap, processed food. The competition and the junk food I saw were the result of global capitalism’s long history of intervention with the indigenous economy. The Inca Empire and Spanish settlements catalyzed this economic shift by throwing Andean, indigenous villagers into slavery for nearly 300 years. Recurrent European diseases decimated Ecuador’s indigenous community by 80 percent by 1582. The Spanish colonizers’ devastating land grabs dispossessed indigenous communities. Without land, the Andeans had no products to feed the local, trade-based economy of San Clemente. This left villagers with few resources and vulnerable on the eve of Ecuador’s Independence from Spain in 1822. Left with few options, villagers worked as forced laborers on the land they once owned. Settlers forced Andean women to work as servants, cooks, nannies, and nurses in their homes. Spanish criolla women took on the role of “modernizing” their laborers through forcing European styles of cooking and consumption. Given the lack of a trade-based economy, to rebuild their chakras, houses, and communities, indigenous people had to integrate into the post-colonial way of life. Once in the capitalist system, their survival depended on income. Ecuador’s economic crash in 1998 continues to contribute to the “modernization” of Ecuador’s indigenous food systems today. The country’s economic crash forced more women to join the workforce. They were out of the house more often and for greater lengths of time. With less time to cook, grocery stores and processed foods emerged as an option for quick, cheap ways to feed the family. The USDA’s 1999 Foreign Agricultural Report found “snacks, ice cream, seasoned noodles, powdered soups, purée, and baby foods” as the most common foods to buy from the United States, underscoring the demand for quick calories and little preparation. This shift coincided with the dramatic increase of the number of grocery stores—signifying an explosion of imported, processed foods, as well. From just 1999 to 2003, the total market share of the two most popular retail chain stores, La Favorita and El Rosado, both doubled, with their sales increasing by more than 200 percent. In 1991, Ecuadorian consumers spent roughly US$14,000,000 on imported food products from the United States. In 2016 this figure increased to US$220,000,000. As noted in the USDA’s 2016 Foreign Agricultural Report, “Younger and lower to middle income consumers’ purchasing power and appetite for imports remains strong despite the economic slowdown”. Corporate control of food, imported or not, challenges the survival of traditional agricultural methods, and contributes to the further colonization of San Clemente’s and other indigenous community’s food systems. Given the larger historic picture, the processed foods sold by store owners in San Clemente is unsurprising. While the storeowners in the village undeniably facilitate this colonization process, the need for money dates back to the 16th century, as does the entrance of “modern” food. My initial shock about the junk food in San Clemente has been replaced with awe and appreciation for the persistence and resilience of San Clemente’s traditional agriculture that despite centuries of colonialism, refuses to disappear. Cover photo taken by Amaury Laporte.